'Meal for All' began in mid-2015 and its Christian and Muslim volunteers work side by side to feed the most vulnerable. 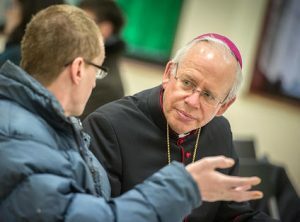 A group of Catholics, including Bishop Paul Hendricks, have visited Finsbury Park Mosque’s ‘Meal for All’ homeless project. The visit was just ahead of Ramadan which began on 6 June in England. 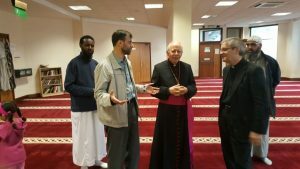 “I’m delighted to have the opportunity to highlight the excellent work being done here, by members of the Muslim and Christian communities, working together for the good of those in need,” said Bishop Paul Hendricks. “They can come to understand the mercy of God, which is often said to be His greatest attribute, if they see that we are showing mercy and kindness to the poor and the needy and if we are seen to be at peace and working in harmony with each other,” the Bishop said. Mohammed Kozbar, Chairman of Finsbury Park Mosque, responded that it was a pleasure to have Bishop Paul Hendricks at the mosque. “While we welcome our guests today, we believe that such a visit between faith leaders will strength the relation between the two largest religions in the world and will promote community cohesion and peace, and it will also send a strong but positive message to the public that we can and should work together for the sake of humanity,” he said. He took over at the mosque in 2005 and local papers report that he and the leaders there have made every effort to ensure there are no radical preachers and terror attack suspects linked to it. For the homeless project they were inspired by the nearby St Thomas’ Church, which runs a similar scheme and with which the mosque has a good relationship. The leadership likes to describe the mosque as also being a community centre. They facilitate youth clubs, attended by Muslims and non-Muslims alike, and regular open days. The Catholic delegation to visit the Mosque’s homeless project included the Bishop but also Canon John O’Toole, and Ms Katharina Smith-Müller – Interreligious Adviser to the bishops of England and Wales. In 2009, the Bishops of England and Wales issued a teaching document on interreligious dialogue titled, “Meeting God in Friend and Stranger”. It urges shared action, or “work[ing] together for the greater recognition of the dignity and unity of all human beings”. “Meal for All” which began in mid-2015 includes volunteers working side by side to support the most vulnerable. 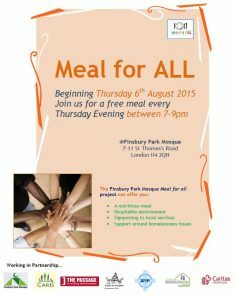 Christian and Muslim work together every Thursday evening at the mosque to feed the hungry. The project includes several community and faith organisations, including The Passage, Westminster Caritas and the SVP, amongst others. The Passage homeless services is takes its values and ethos from the teachings and example of St Vincent De Paul as a Vincentian organisation. The late Princess Diana brought her sons Princes William and Harry to visit The Passage so they would be aware of those less well off. Prince William visited The Passage very recently during May 2016.